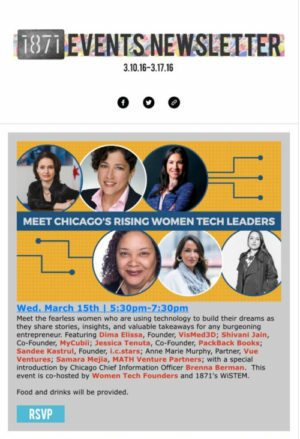 Press Release: Chicago, IL — Dima Elissa — On March 15, 2016, VisMed•3D’s CEO and Founder, Dima Elissa joined a host of powerhouse women in tech to discuss their experiences starting and growing businesses. Women Tech Founders (WTF) celebrates the stories of seasoned and compelling women leaders in technology through live events and media, such as this hosted at 1871 at the Merchandise Mart. Elissa who was selected by Chicago Tribune’s BlueSky Vault as one of the top 100 entrepreneurs in Chicago, shared her lessons in leadership with a room filled with eager minds. Not only is she a leading entrepreneur in technology but she pursues her passion of helping other women pursue their goals in entrepreneurship and technology. Elissa shared her entrepreneurial journey with over 200 attendees, leaving a trail of nuggets of wisdom from recollections of her motto, LifeCrafting. She encouraged bravery when she said, “don’t let perfect be the enemy of the good” and “sometimes things happen and you don’t know why, but if you are open, there is incredible value.” In her words, she sparked fortitude and optimism to women and encouraged them to let go of the voices in their heads telling them they can’t and instead, execute their passions with vigor and intention. The WTF event began with opening remarks from Brenna Berman, CIO and Commissioner of Innovation and Technology in Chicago. Followed by numerous fascinating women including Shivani Jain, Co-Founder of MyCubii, Jessica Tenuta, Co-Founder PackBack Books, Sandee Kastrul, Founder i.c.stars, Ann Marie Murphy, Partner Vue Ventures, and Samara Mejia, MATH Venture Partners. It was an evening filled with inspiring tales of successful women in technology.